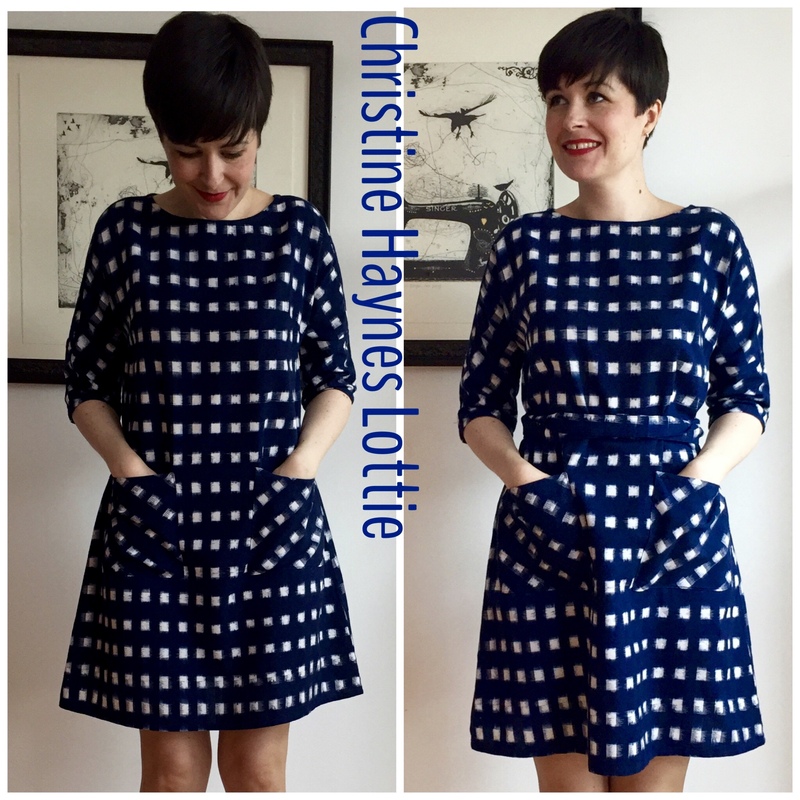 There are so many options to choose from in deciding which Lottie (from Christine Haynes) to make. It is also the longest pattern I own because of all the different versions- amazing value! 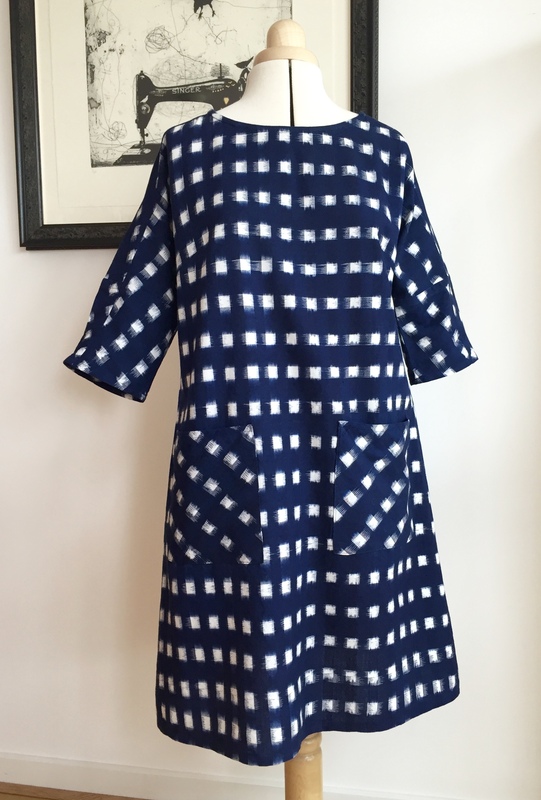 I bought two and a half metres of a beautiful ikat from John Lewis, it was quite narrow and 108cm but just enough for this dress when cut using a full set of pattern pieces. 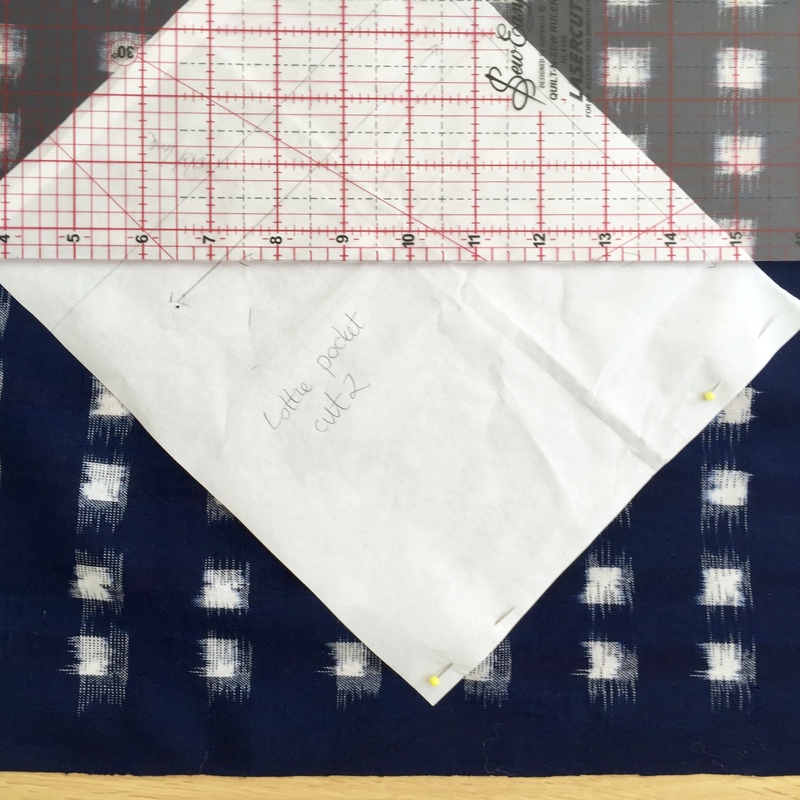 The quilting ruler was really helpful to get the small pieces placed on grain. 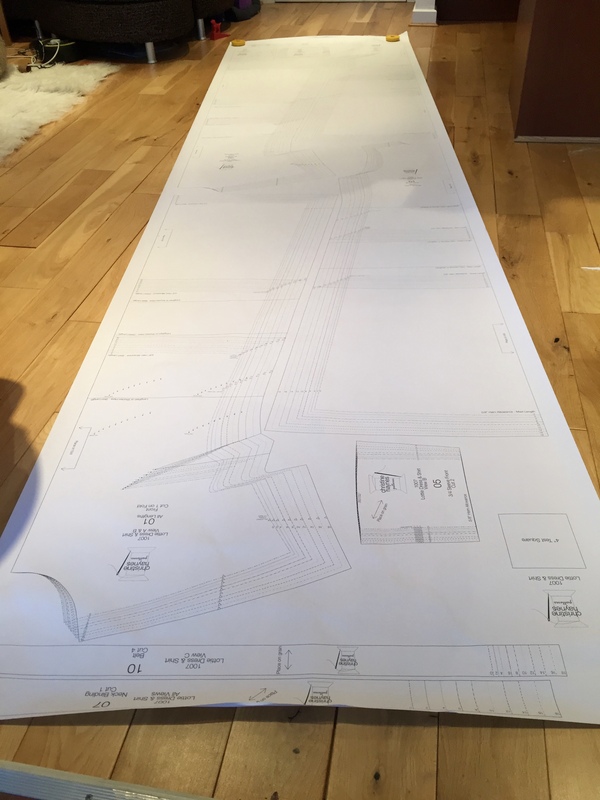 I based my size choice on the difference between the body and finished garment measurements and traced a straight size six off the pattern. Going by the body measurements alone would have meant a six at the bust, eight at the waist and ten at the hips. There’s lots of ease built into this pattern though which I love so it makes it easy to decide on the type of fit you want. 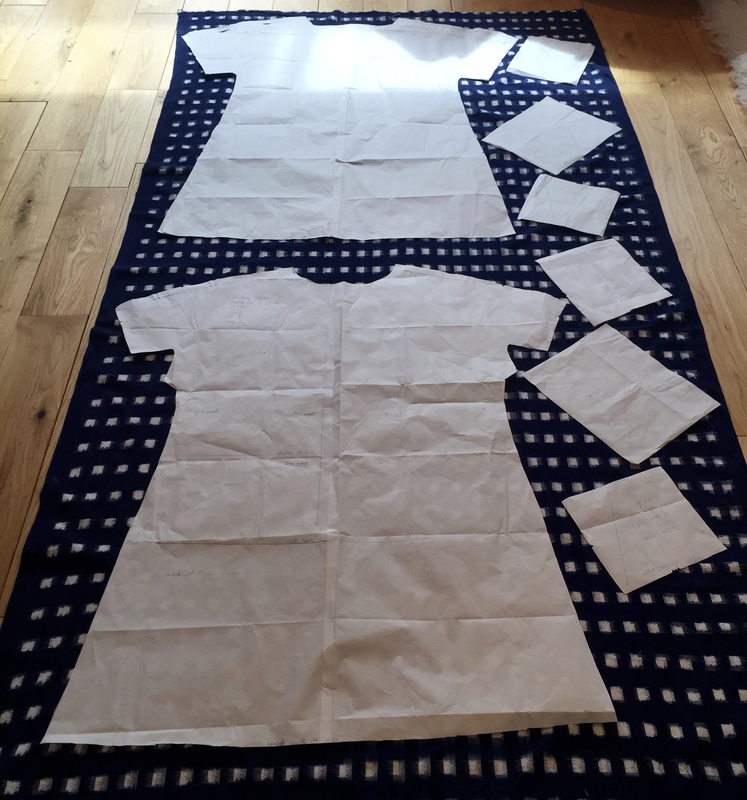 I took the lazy route and traced the main pieces in a size six but used the size 18 length front and back rather than slash and spread at the lengthen/shorten line on the pattern then added a further one and a quarter inches when I cut it out (just for good measure). 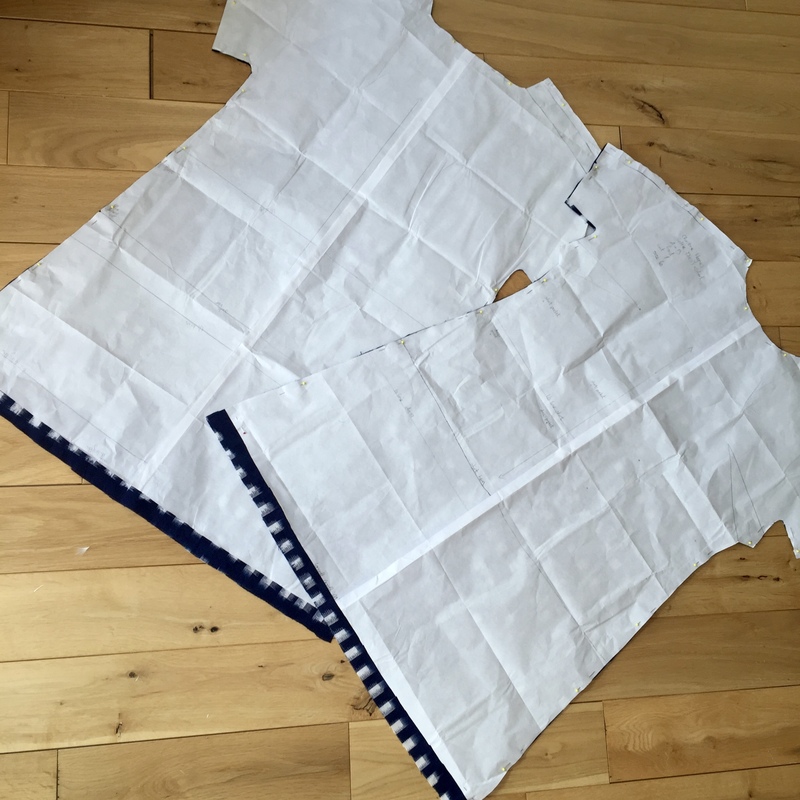 I made a quick toile first to check the fit- perfect, even the darts were right. The only pattern adjustment I made was a forward shoulder one, by about an inch. It’s one I always need but don’t often do. My favourite explanation for how to do this is the one in Threads no. 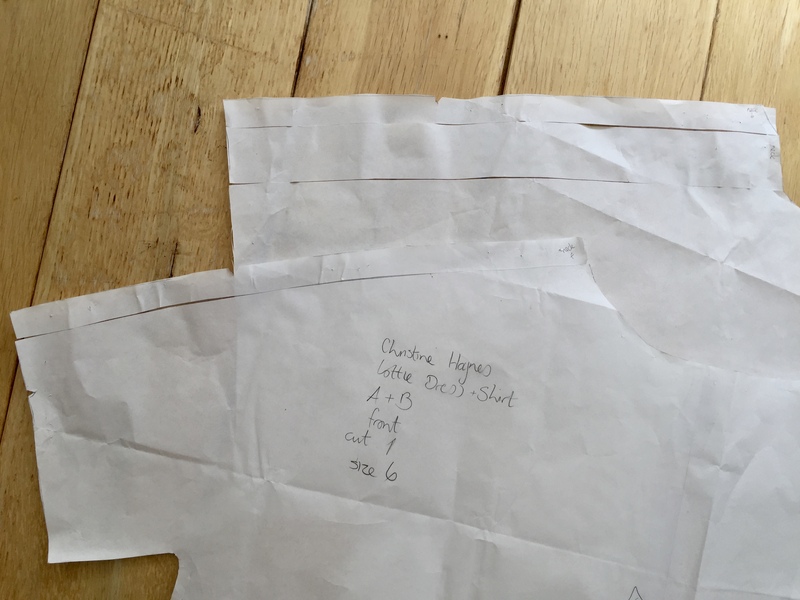 184, so simple… remove shoulder seam allowances front and back (label which is which for later), cut a strip off the front shoulder seam (in this case an inch) and tape it onto the back one then re-attach seam allowances…done. I did the same to the front and back sleeve extensions to keep everything right. 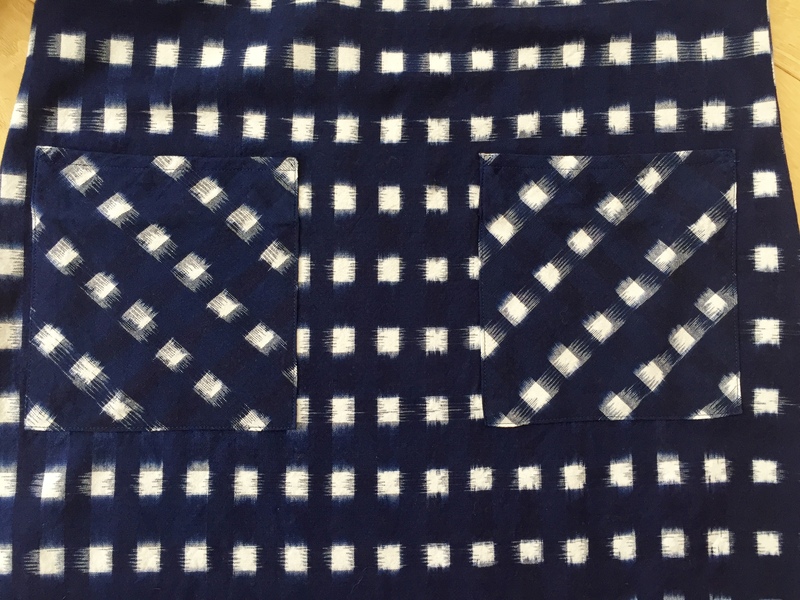 I cut the pocket pieces on the bias and sewed a strip of the selvedge into the pocket piece just above the fold line to keep the top edge from stretching out. I went with Wonder Tape to keep the pockets in place whilst I stitched them. I think it is one of the best pieces of sewing equipment for times like this (and a multitude of others). It’s brilliant on knit hems and necklines too- no waviness or ripples when they’re positioned with that first. What’s not to love about double sided tape that washes away on the first spin through the washing machine? It also means no pins to interfere with the edgestitching. Not essential, but it makes achieving a good finish much easier. I’ll also admit to using a small dab of Pritt Stick to keep the bottom folded corners from peeping out whilst I stitched the pockets down. It washes out at 30 degrees and works really well on small areas like that. 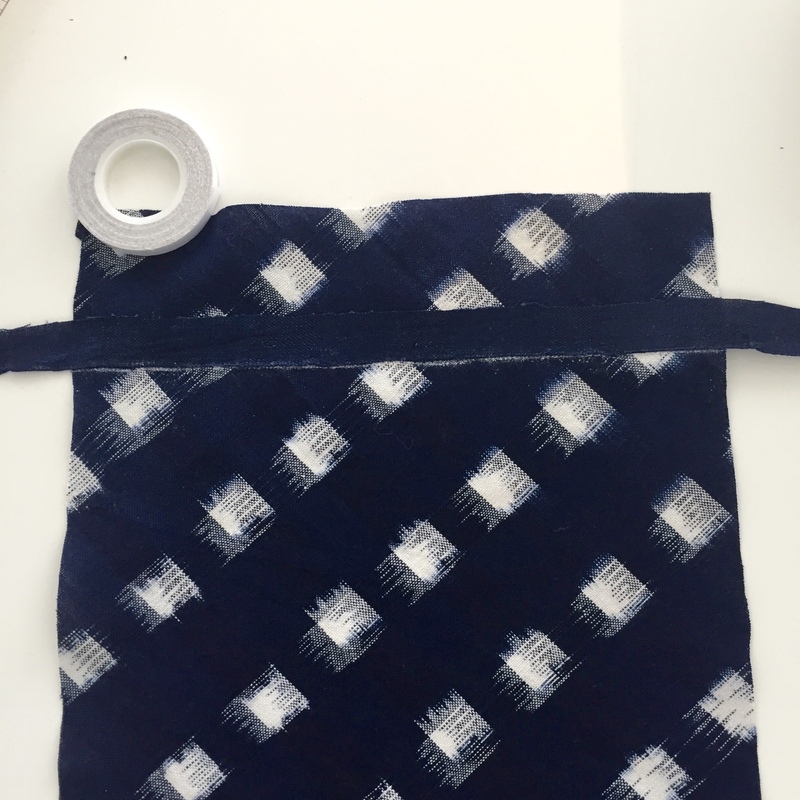 It could possibly be categorised as slightly cheating but it worked and the pockets came out beautifully. 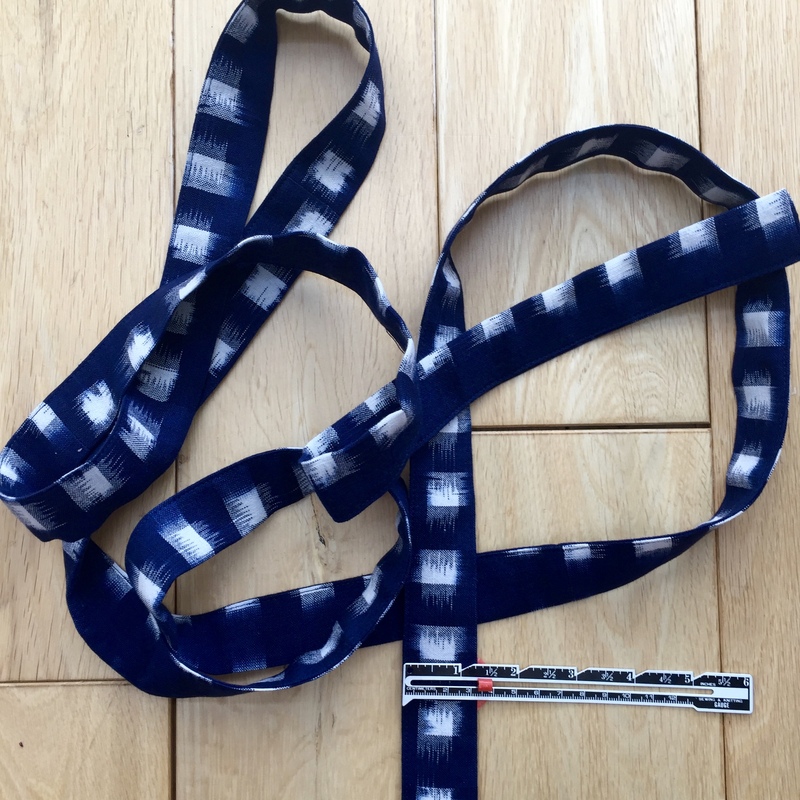 The construction is straightforward helped by a brilliantly detailed sewalong.I finished all the edges with the overlocker and squeaked a belt out of the leftover fabric. 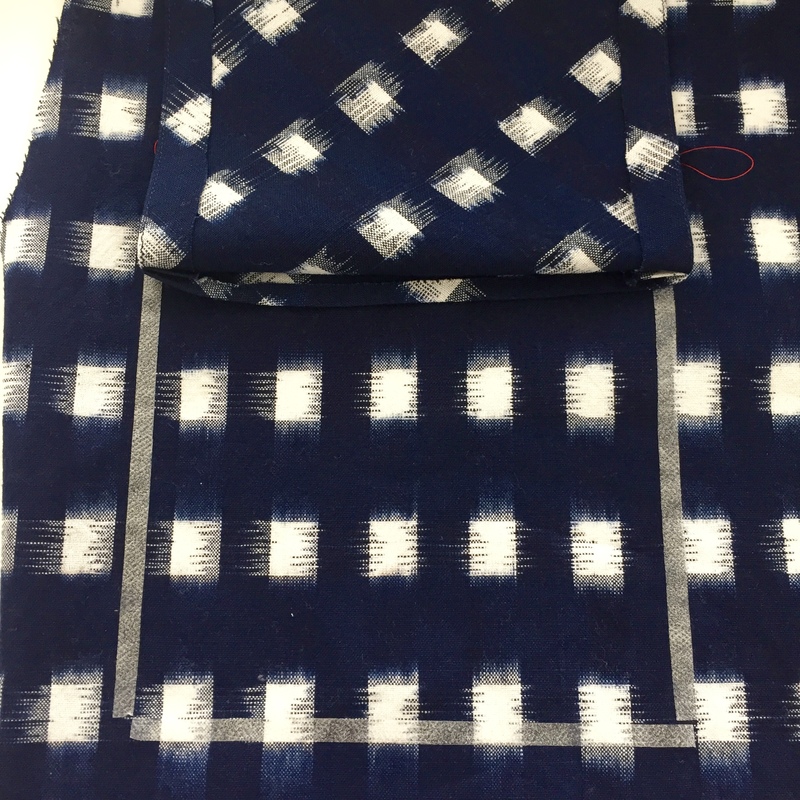 I just cut what I had left into four pieces which were different lengths and sewed them up. It ended up one and 1/4 inches wide. The pattern is a bit all over the place because of the slightly ad hoc construction process but who’s going to notice that when it’s wrapped round my waist??? And I used all the fabric! I like it equally belted and loose. That’s a first for me. This is a genius piece of pattern drafting. 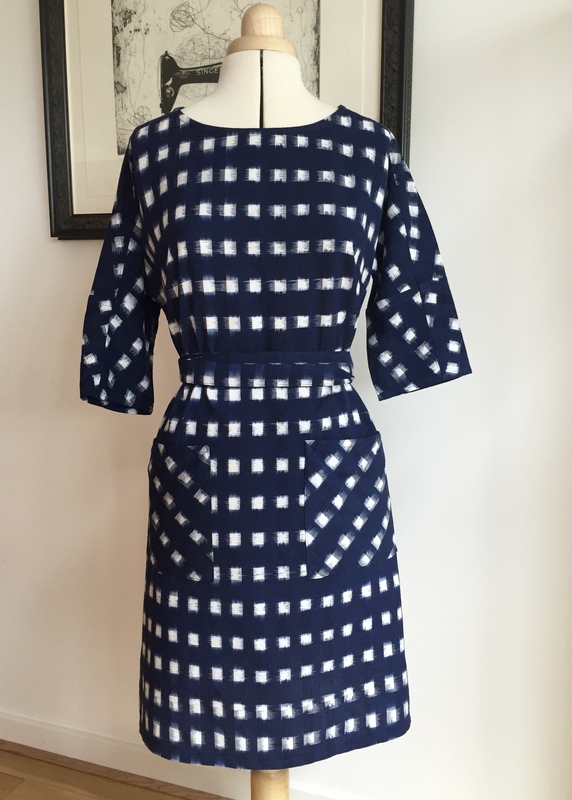 I love the combination of shape and ease as well as the multitude of length and sleeve options not to mention the pattern hacks Christine has added to the sewalong. My search for the perfect shift/tunic/dress/shirt is over- this is very definitely the one for me. And because I love it so much….there are more…. Such a lovely dress!! It turns out perfectly – thanks for the in depth review! Hi 🙂 It’s my first time on your blog & I never usually comment but I just have to after reading this! I absolutely love the choice of fabric, it really has produced a lovely classic garment. Thanks for sharing your body measurements too, they match mine and I can now go ahead with cutting the pattern out confident in knowing I’ve picked the right size (that’s the only thing that’s been holding me back, my measurements are all over the place with CH patterns so I’ve been holding from sewing it all up!!). Youre now ‘starred’ on my browser, so looking forward to coming back to read about more of your makes! Thank you so much for such a lovely comment Cara!!! 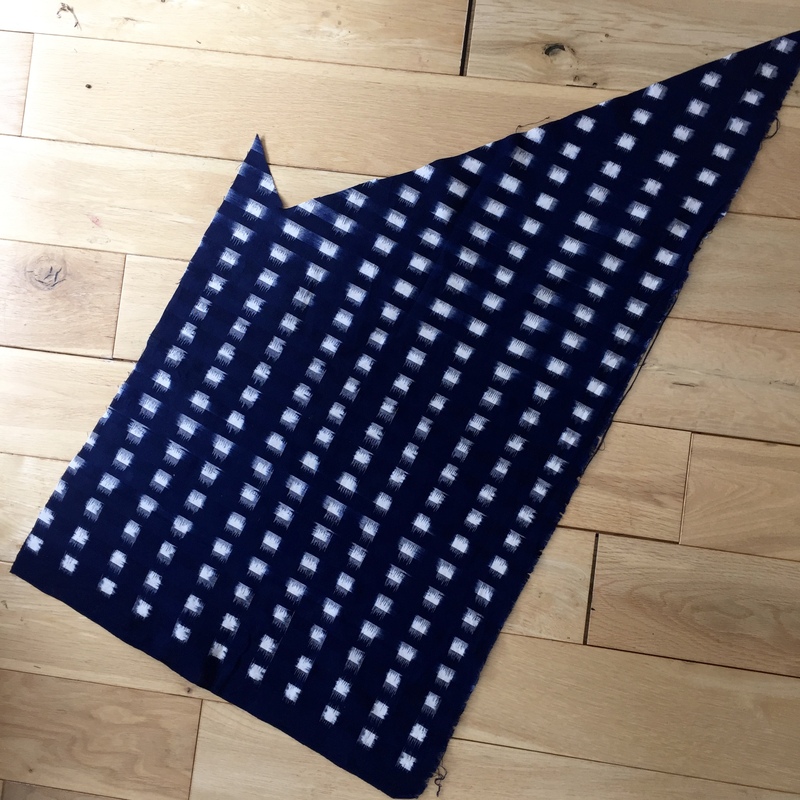 I’m really pleased you found the post helpful- I know how much I love reading what others have done with patterns so your comment brought a big smile to my face. 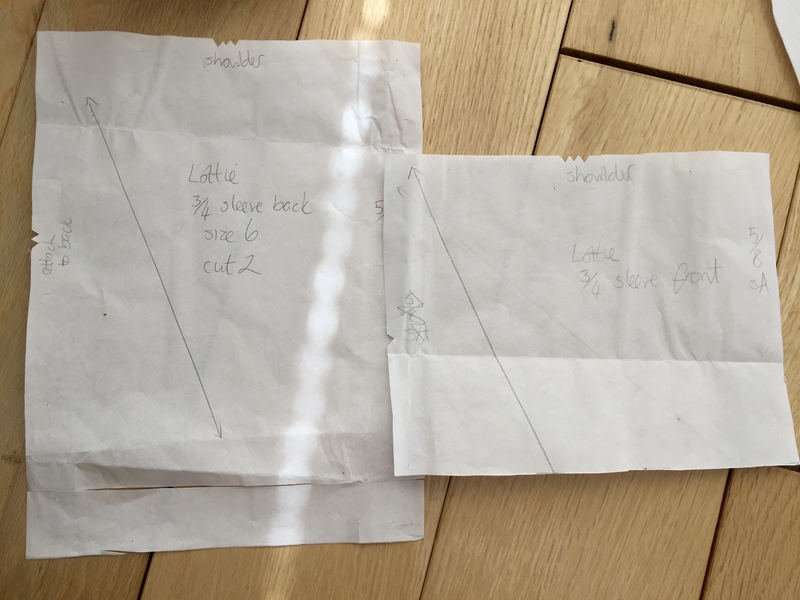 Happy Lottie sewing!